The Actors art is the art of action! The ICAT Action Week­end is an immensely pop­u­lar course where par­ti­cipants immerse them­selves in the toolkit that has made the school so pop­u­lar, the prin­ciples of Mike Alfreds, led by ICAT founder, Simon Trinder. Mike Alfreds is a course advisor at ICAT. He is an award win­ning, inter­na­tion­ally renowned dir­ect­or who has been named one of the best dir­ect­ors in Bri­tain by Sir Ian McK­el­len and Mark Rylance. He tutors and coaches actors world­wide includ­ing a number of Hollywood’s elite. 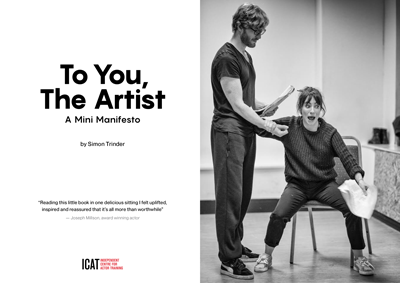 His free­dom enhan­cing approach to the craft as detailed in his book Dif­fer­ent Every Night, is intro­duced by Simon in this hugely ener­gised, prac­tic­al and inspir­ing week­end course. This will change your approach to acting in the most won­der­ful way. Mikes renowned book and Simon as Trinculo in the RSC's groundbreaking production of The Tempest. Simon, who has worked with Mike extensively, is an award winning Royal Shakespeare Company actor with 17 years experience in high profile theatre, radio, film and television www.simontrinderactor.com. His trademark teaching style balances energy with clarity earning him the name 'The Bolton Bullet' by a recent participant. He creates an environment where ideas are kept simple but effective and there is an invitation for all to fail safely.
" I want to do my whole career over again knowing what I know now!" "10 out of 10. This technique is what I've been missing. 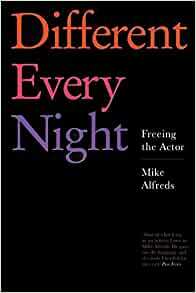 It's taken the myth out of acting!" "And so concludes an incredible weekend of actioning. HIGHLY RECOMMEND"
"I feel my toolkit, brain and gut bulging with new ideas"
Over 18's only, working actors or actors in training. Experience is not necessary, just a committed attitude. Please click the button on the bottom of this page and scroll to relevant date to book on! I’ve just done the weekend Action Course and had the most amazing experience. The best training I’ve had. I left every session feeling energised and inspired. Please click the link and scroll to the event you would like to attend.